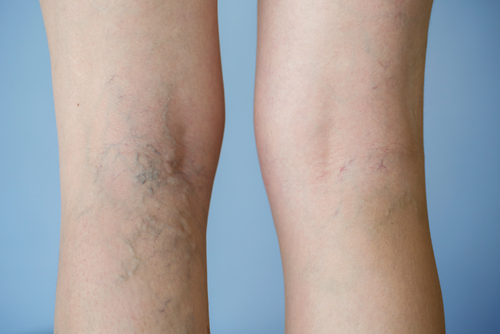 Varicose veins are swollen, twisted veins that can be seen just under the surface of the skin. They look lumpy and dark blue or purple. These veins usually occur in the legs, particularly the calf and sometimes in the thighs, but they can also develop in other parts of the body. Spider veins are similar to varicose veins but smaller. They are also closer to the surface of the skin than varicose veins. Varicose veins can be caused by weak or damaged valves in the veins. The heart pumps blood filled with oxygen and nutrients to the whole body through the arteries. Veins then carry the blood from the body back to the heart. Veins have valves that act as one-way flaps to prevent blood from flowing backwards as it moves up your legs, against the flow of gravity. If the valves become weak and the blood doesn’t flow properly through the veins in the legs, blood can pool in the veins and varicose veins can form. There are many factors that can raise your risk for developing varicose veins. They can occur in men or women of any age, but varicose veins most frequently affect women in the childbearing years and older people. Varicose Veins are very common. There are certain factors that can increase a person’s tendency to develop varicose and spider veins, such as medical history. Being born with weak vein valves increases the risk of developing varicose veins. Having family members with vein problems also increases one’s risk. About half of people who have varicose veins have a family member who has them too. Below you can read about four types of people who are at risk for developing varicose veins. Many women first develop varicose veins or find that they get worse during pregnancy. As a woman’s uterus grows, it puts pressure on the large vein on the right side of the body (the inferior vena cava), which in turn increases pressure in the leg veins. Varicose veins are more common in women than in men, and if developed, they tend to get worse with each successive pregnancy and with age. There is good news: varicose veins don’t put the mother or baby at any risk and tend to improve after giving birth, especially if they were not present before pregnancy. Exercise daily; it is important to walk around to help blood circulation. Strive to keep within the recommended weight range for stage of pregnancy. 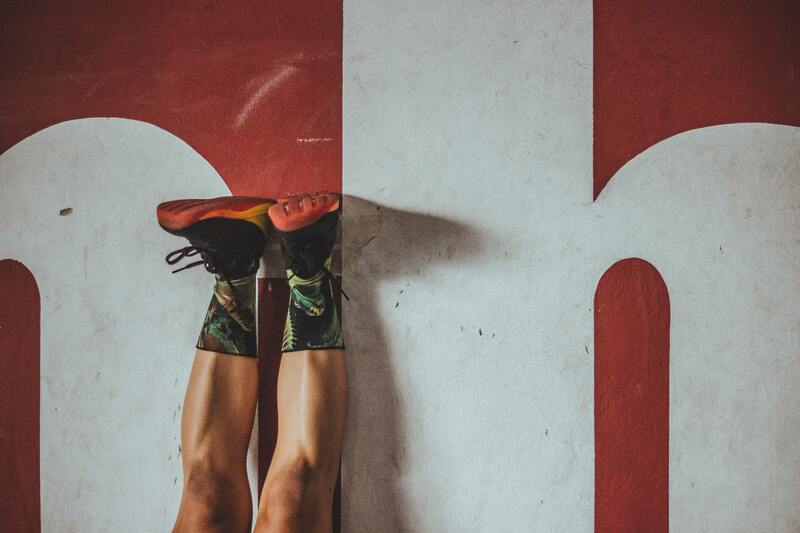 Elevate feet and legs whenever possible. Often, people overweight do not realize they have varicose veins, as the swollen veins are not visible on the surface of the skin, due to excess fat. Being overweight or obese can put extra pressure on the veins. Having low muscle mass and high body fat decreases the support for the veins, which can lead to varicose veins. Over time, the pressure in the leaking veins may cause damage to the skin on the lower leg; this is usually when patients will go and see a specialist. This is a major issue in the overweight population and they are at greater risk of leg ulceration. Keeping the body in an upright position requires considerable muscular effort; it is particularly unhealthy to stand motionless. It effectively reduces the blood supply to the muscles. Insufficient blood flow accelerates the onset of fatigue and causes pain in the muscles of the legs. Gravity pulls blood down into your legs and feet when you’re standing up or sitting down. So the veins have to work extra hard to get that blood back up to the heart, and some of those veins can wear out over time. Prolonged and frequent standing, without some relief by walking, causes blood to pool in the legs and feet. When standing occurs continually over prolonged periods, it can result in inflammation of the veins. This inflammation may progress over time to chronic and painful varicose veins. The tendency to develop varicose veins often increases with age. According to the United States Department of Health and Human Services, half of all Americans over the age of 50 suffer from varicose veins. Aging causes wear and tear on the valves in the veins that help regulate blood flow. Eventually, that wear causes the valves to allow some blood to flow back into the veins where it collects instead of flowing back up to the heart. If you think you have varicose veins and would like to schedule a FREE fast-track consultation with the expert at Vein Clinics of America call (844) 423-8346 or sign up online and we will contact you.